Liturgical and para-liturgical services are frequently available. There are five all-school liturgies during the year, and there are four prayer services during the year, once each quarter. The schedule allows for liturgy almost every Friday morning. These FMLs (Friday Morning Liturgies) are planned by students as part of a class and occur 22 to 25 times a year. The Meeting Period schedule allows for one reconciliation service per quarter for each grade and one yearly class mass. Every school day begins with a prayer over the PA, mostly designed and read by students. The retreat program is extensive. All freshmen attend a one-day retreat, as do all sophomores. Traditionally, over 95% of the juniors attend an overnight retreat and 98% of the seniors attend a four-day, three-night Kairos retreat. The retreat program also offers many opportunities for developing student leadership. 194 seniors are involved in the InSIgnis program, which provides 85 mentors for the freshmen, 30 core members and 79 seniors lead a sophomore, junior, or senior retreat. All students are required to complete 100 hours of community service before entering senior year. Over 90% of the last three graduating classes completed more than the required minimum and approximately 30% each year do over 200 hours. 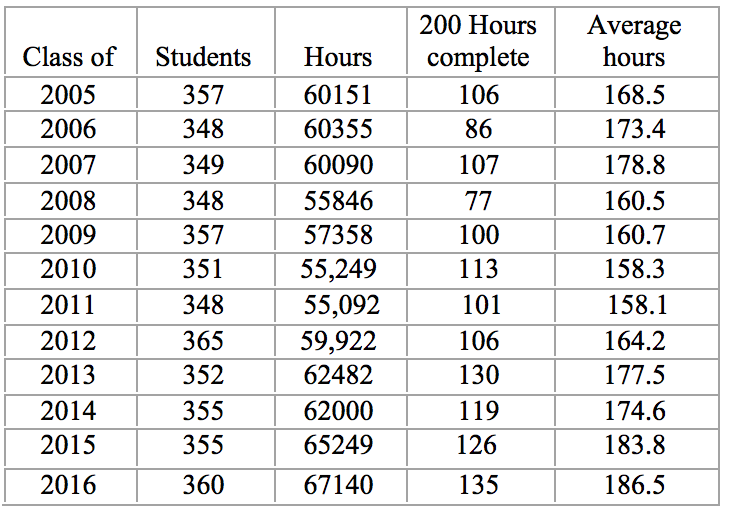 The average hours-per-student ranges from 160 to 180 hours and these are accomplished at over 100 different agencies. SI offers an Immersion Program where eight students and two adults live and work in an impoverished community. 66 students and 16 adults participate at eight sites each summer. In the past, the sites have included San Francisco, Salinas, Sacramento, New Orleans, Tacoma, Ireland, Costa Rica, White Plains Apache Reservation, Appalachia, Tijuana, Birmingham, East Los Angeles, and El Salvador. On average, more girls than boys apply for Immersion. In order to create some gender balance in the groups (two females to one male), the program usually accepts a larger percentage of male applicants (85%). In the summer of 2012, Campus Ministry added a one-week Service Trip, similar to, but less intense than, the Immersion Trips. The program is expanding and has included trips to West Virginia, Kansas City, and New Jersey.